On our journey to becoming true rosarians, we have discussed different types of roses as well as how they can be used. Roses are not limited to a hedge or bush. They can be used vertically, too! Climbing Roses are an easy and low-maintenance addition to your yard or garden that can provide a vertically pleasing aesthetic! 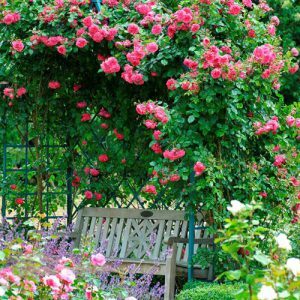 I’m sure you’ve imagined your dream garden before, it may have included an image of roses covering many surfaces such as trellises, arbors, and fences. Climbing Roses come in many varieties, can survive in many zones, and are available in dozens of colors! Once you determine which rose is suited for your growing zone, you can choose the color you like and the growth habit that would be required for the area in which you wish to grow it. You may want to choose one that is disease-resistant or repeat blooming. When choosing the area in which you would like to grow your climbing rose, you must consider how much sunlight it receives. Most roses need partial to full sun to thrive properly, so a fully shaded area would probably not allow them to grow to their full potential. However, you do not want to grow them in an area where they may be scorched by all-day summer sun. Training your climbing roses can be one of the most tedious steps in their growing process, but fear not – it is not as difficult as it sounds! 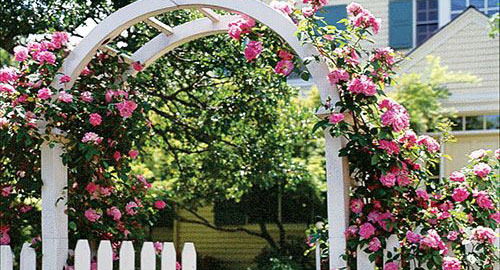 Climbing Roses are often used to frame doorways, cover a fence, or used on a trellis. To grow this way, the stems will need to be trained otherwise they will grow in whatever direction that they choose. Air circulation is a key component in training your climbing roses, without it they are more prone to disease. 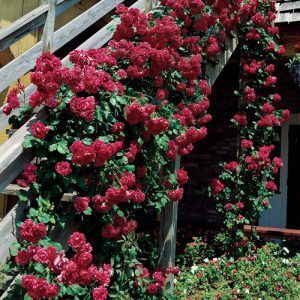 For example: If you would like to use your climber on a wall, use a free-standing vertical support that will give your rose a few inches of airflow between the support and the wall. You can hand-tie your stem to the support. As the climber grows, you can manipulate the stems in the direction that you wish for them to grow. It is also recommended that you do not heavily prune your climbing roses for the first few years, as it may undo the training. Pruning climbing roses is truly only necessary once per year after the plant has become fully established. Some gardeners will prune there climbers for maintenance and shape in the spring and then prune again in the fall. With proper pruning, your climbers will grow stronger and will produce more blooms! When it is time to prune – use a good pair of pruning shears to remove any dead, diseased, damaged, or crossing canes. And as always, deadhead your roses to encourage re-bloom! It’s time to take your garden to the next level with climbers! We would love for you to share any tips you have for making these beautiful blooms thrive and grow to their full potential! Happy Gardening!